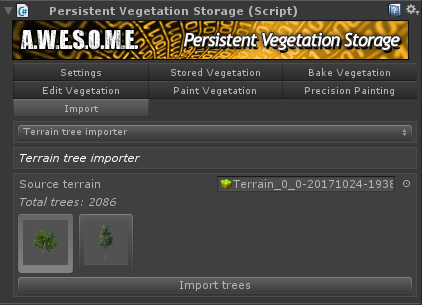 The terrain tree importer will show you all trees in the terrain assigned to the VegetationSystem component. You can also see tree count. Press the “Import trees” button on each of the available trees to import. The trees will be added as VegetationItems and the instances imported to the Persistent Storage.